Enfield Cycling Campaign are leading feeder rides to the event for anyone cycling direct from here. 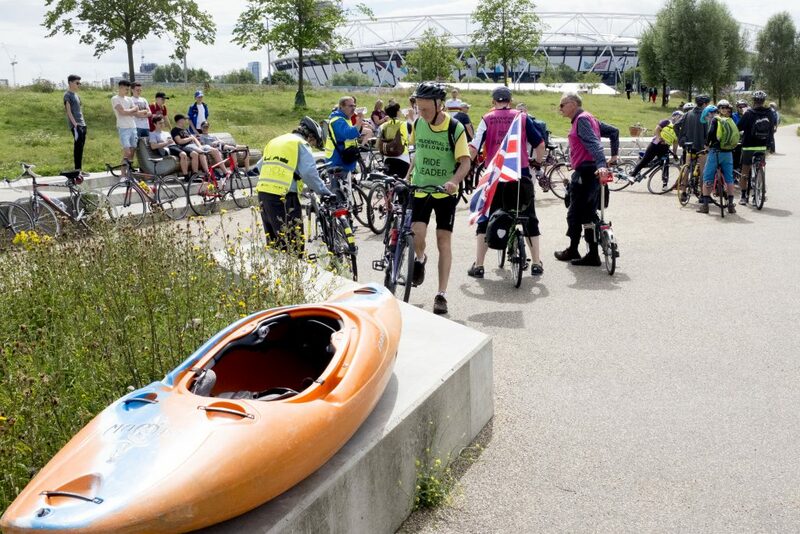 Our main ride will start from Edmonton Green and is almost entirely either off-road (eg along towpaths or through parks) or on a segregated Cycle Superhighway. Trained ride leader David Hilliard and marshals will help keep everyone safe. It’s quite a long ride – approximately 12 miles each way – at a gentle but reasonable pace, so it is suitable for all ages and abilities. The ride will end on Cornhill, in The City, which is on the FreeCycle route and is the meeting point for anyone wishing to join the return ride at the end of the day. Meeting points: Edmonton Leisure Centre, N9 0TR at 0900 for the outward ride. Cornhill, EC3V 3NJ at 1445 for the return journey. We will also be leading a ride from Palmers Green to join the Haringey feeder ride at Turnpike Lane. This will be mainly on-road but a leader and team of marshals will help to keep everyone safe. The distance is about 10 miles and all ages and abilities are welcome. The Haringey feeder ride will end on Lothbury, in The City, which is on the FreeCycle route and is the meeting point for anyone wishing to join the return ride at the end of the day. Meeting points: Palmers Green Library, N13 4EY at 0900 for the outward ride. Lothbury, EC2R 7HF at 1445 for the return journey. If you want an easier day (either both ways, or just the return journey) we recommend taking bikes on the Overground between Edmonton Green or Enfield Town and Liverpool Street. Liverpool Street station is about a 5-minute walk from the FreeCycle route. If you have any questions please contact us on info@enfieldcc.co.uk and we will try to help. This entry was posted in Easy Riders on July 18, 2018 by Clare Rogers.